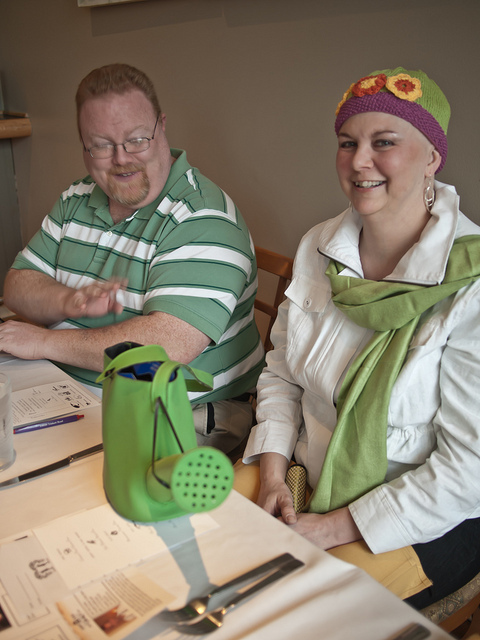 Garden, Grocery, Gadget Girl: Chemo Conquered! Final Chemo - Happy Spring! This week marked the official start of spring, with some welcome sunshine and warmer temps, (although more snow and cold is due this week! ), and my sixth and final infusions of Taxotere and Carboplatin. I still have twelve shorter infusions of Herceptin, on the same 21 day cycle, but it is more like a smart bomb and just heads for the estrogen positive cells and doesn't bother making your hair disappear or ruining your appetite. Round five was pretty uneventful, and definitely the least horrible. I bounced around the next day on my steroid high, and when it wore off, I went to bed and mostly stayed there for about four days, coming up to drink as much water as I could and pop an anti-nausea pill. I didn't have the fire belly, but I had no appetite - it pretty much always felt like I was full, and it lasted pretty much the entire three weeks. I've still managed to put on about five pounds, which people helpfully try and blame on the drugs, but I'm not kidding myself that it's self inflicted. They don't put as many Girl Scout cookies in those boxes anymore and it seems silly to not finish the sleeve when you open it. Among other less than stellar dietary choices I've made. I succumbed, thanks to a 30% off Kohls coupon, and just bought some bigger clothes for now. Once I get back on my regular gym schedule (I was so happy to at least get 30 minutes each day this week on the bike after nearly two months off), and return to a normal diet, it'll go away. On the upside, my eyebrows and lashes have hung on like troopers, and it looks like I may keep them. On the downside, my seasonal allergies have returned with a particularly nasty vengeance. I can only imagine what my itchy, swollen eyes would look like sans lashes and brows. All in all, it wasn't a whole lot of fun (obviously, duh), but it could have been a lot worse. I am a little afraid of the side effects from the radiation. I've talked to people who couldn't finish the schedule due to the skin burns, and I am not looking forward to any more cumulative fatigue. I'm tired of being tired, frankly. So I am ready for spring. While my stylists may think I overdid the accessories, I couldn't resist busting out my watering can purse because it went perfectly with this awesome spring hat sent to me by Patti Anastasia. Also pictured is Tom Noe, of Exploring Food My Way. Check out his blog for the photos of the Dinner in the Dark that was my pre-chemo last supper. Tom and Edsel, who took this picture, have far better cameras than me, so I just ate and enjoyed. So glad to hear the final round of Taxotere and Carboplatin went as well as it did! Hopefully the second two legs of your treatment will be less draconian. It was great to be able to share the meal on Monday night while you could still enjoy it. I look forward to sharing another one when you are feeling even better! Congrats on getting through chemo! You look great! For what it's worth...I found radiation to be pretty much a breeze. I had no skin problems at all--I've had far worse sunburns. I also found my energy returned quickly. I offer that up only as a possibility for you to focus on rather than the horror stories you hear. Radiation can be not bad at all, so keep that thought. This next part I hesitate to mention...but I'm going with the "knowledge is power" theory-- my eyelashes and eyebrows did not fall out until after chemo was over. BUT...I "only" had 4 rounds, so yours have already hung in there longer than mine and perhaps have made it. And thus you may be "lucky" (in the "cancer patient lucky" way ;-) ). All the best in your next phase! So happy to read that you are finished with chemo. Throughout it all you have had such a positive outlook. You are an inspiration. BTW...a girl can never over accessorize! A Little Wood Pulp for Breakfast?